Looking for quality new homes in Greensboro, NC? You might consider building a new home with customizations to make it accessible to older people. The number of older adults in America has been rising steadily and is projected to grow by as much as 133 million by 2030, more than a 70% increase since 2000. 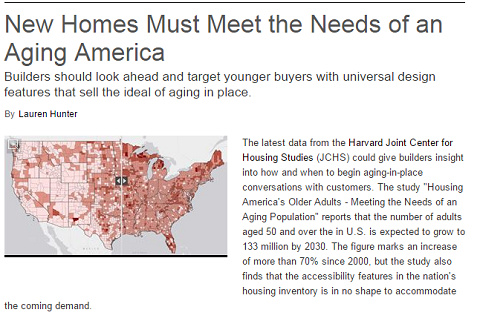 This is according to a study conducted by the Harvard Joint Center for Housing Studies titled “Housing America’s Older Adults – Meeting the Needs of an Aging Population”. There have been similar other findings over the years so the news is really nothing new. However, despite America’s awareness of the fact about its aging population for a long time now, the study added that most houses still do not have the necessary construction details to accommodate the elderly, such as wider doorways or lever-style doors. Researchers note in the report that as people age, they are less likely to relocate, and that the “residential mobility rate drops sharply after age 50.” and continues to decline among homeowners in their 60s and beyond. For builders, this means introducing aging-in-place and universal design features into homes that will make younger buyers take notice, enticing them to find a new home that will help them and their family grow old gracefully. Indeed, targeting younger home buyers may be essential. The Harvard report notes that more than 70% of homeowners aged 50-64 were still paying off their mortgages in 2010. A separate study from the AARP has shown that three out of four people prefer to remain in their homes for as long as they can. This makes more economic sense, instead of going to assisted-living facilities, which can cost over $34,000 annually. The need for a more universal design for homes that accommodates fixtures and details for senior living, is earning some appeal. Inside most homes today are fixtures and built in areas that can present some risks to older folks, especially when they’re all alone. Raised doorway thresholds, rugs, and electrical cords can be hazardous as they can cause a slip or a fall. Whether you are considering keeping your home until you have retired, or you are looking for a safe home for your aging parents, you might want to consult with builders who specialize in building custom homes in Greensboro, NC. Building contractors, such as R and K Custom Homes can help you with ideas during the design stages so that you can enjoy a happy and safe home for years to come.